Pyongyang says a new ballistic missile was test-fired on Sunday, adding that the launch was a success. The North Korean missile flew over 500 kilometers, landing in the sea and stirring up world leaders, with the US rushing to reassure its allies South Korea and Japan. A new type of strategic medium-to-long-range ballistic missile, called Pukguksong-2, was test-fired on Sunday, the North Korean state news agency KCNA said. North Korean leader Kim Jong-un personally supervised the launch, which the KCNA said was Pyongyang’s new means to deliver nuclear warheads. 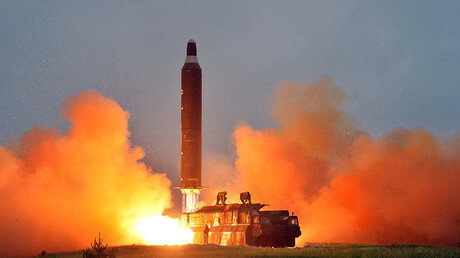 The new missile was also successfully tested for its ability to dodge interceptors with evasive maneuvers, Yonhap news agency cited the statement as saying. Another major boost for North Korean missile technology is the solid fuel engine said to be used in the new weapon. Pyongyang has been testing the engine, which would give the rockets greater range and make the launches harder to detect, over the past year. The technology was said to be tested previously in a submarine missile launch. “We regard North Korea's missile test, carried out on February 12 this year, as another defiant disregard of requirements of the relevant UN Security Council resolutions. This cannot but cause regret and concern,” the Russian Ministry of Foreign Affairs said in a statement on Monday. China has also voiced grave concerns over the latest North Korean missile tests. Ballistic missile tests run contrary to the UN resolutions, Foreign Ministry spokesman Geng Shuang told a daily news briefing in Beijing on Monday. “All sides should exercise restraint and jointly maintain regional peace and security,” Shuang said, adding that China would participate in talks at the United Nations on the launch with a “responsible and constructive attitude,” Reuters reported. 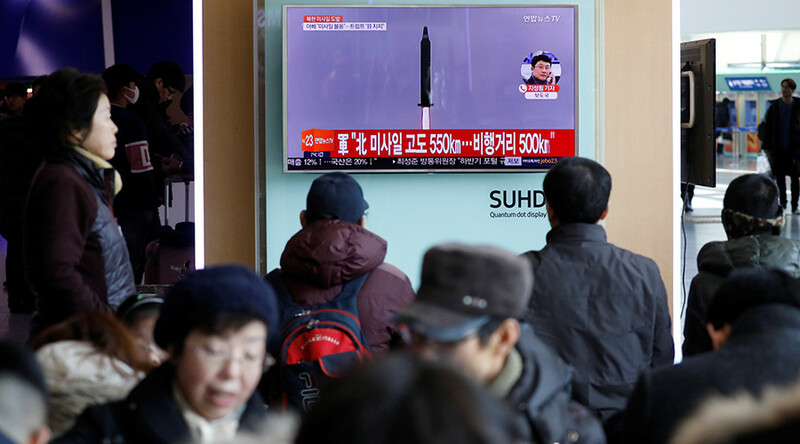 The Sunday launch gave rise to speculations whether it was a new intercontinental ballistic missile (ICBM) being tested, as Kim promised that the allegedly developed long-range ICBM would be test-fired in 2017. The flight path was also analyzed, with some reports suggesting it might have indicated a failed launch. The missile reportedly flew upward to an altitude of 550 kilometers (342 miles), before landing into the Sea of Japan 500 kilometers from the launch spot in the northwest province of North Pyongang, South Korean military sources said. It did not reach Japan’s economic zone. However, the KCNA said the markedly high angle was chosen for the “safety of neighboring countries,” Reuters quotes. The Pentagon, which earlier said it was closely following and tracking each North Korean missile launch, declined to comment on Pyongyang’s statement when contacted by Sputnik news agency. “Refer you to North Korea to characterize their testing operations‎,” a Pentagon official told Sputnik. Meanwhile, the US, Japan and South Korea have requested an urgent meeting of the UN Security Council to consider a response to the North Korean ballistic missile launch. The meeting is expected to convene Monday afternoon, Reuters cited a US official at the UN as saying. North Korea has been gradually advancing its nuclear program despite facing increasingly tough international sanctions. Over the last year, North Korea performed two nuclear tests, on September 9 and January 6, which became its fifth, in addition to several missile launches, that triggered new wave of punitive measures form the international community. In March, the United Nations Security Council adopted a resolution, imposing harsh restriction on the country’s imports. All cargos leaving and entering the country were subjected to mandatory inspection. In addition to that, all imports and transfers of small arms were prohibited. The latest resolution passed by the UN Security Council on November 30 targeted the country’s main source of export, coal, as well as that of copper, nickel, silver and zinc. It was estimated that as a result of the latest round of sanctions the North lose about $800 million a year in revenues.